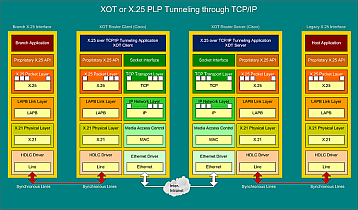 XOT (X.25 Over TCP/IP) or RFC 1613 is a possible solution when all ends, both central and branch offices, use X.25 equipment and the Internet/intranet replaces an X.25 Packet Switching Data Network (PSDN) or point-to-point X.25 leased line connections. PSDNs are more expensive, slower, and often charge for traffic and number of virtual circuits. Most important, maintenance and support are ever increasing. For that very reason, they are fast disappearing. Most companies using PSDNs already have alternative Internet/intranet or TCP/IP WAN connections. Prior to XOT, X.25 over Frame Relay (Annex G) was used for the same reason. 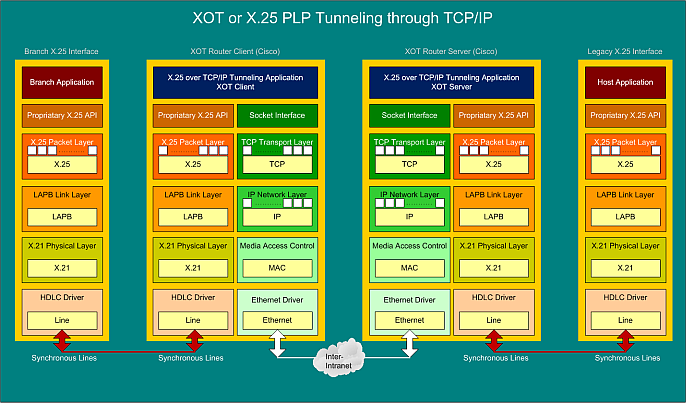 Cisco, the major supporter of RFC 1613, addressed the need by tunneling X.25 data through a TCP/IP connection without changing the existing X.25 connections, provided they use CCITT Recommendation X.25 1984 or later. Under RFC 1613, only the X.25 Packet Level Protocol (PLP) or packets are encapsulated into a TCP/IP stream. Because X.25 uses packets, but TCP/IP is a character stream protocol, the second 2 bytes of a 4 byte header define the size of a following packet. There is no LAPB layer traffic, and there is no LCN0 traffic. SVCs are established via Call Request/Call Accepted Packets, facilities for packet and window size are mandatory. 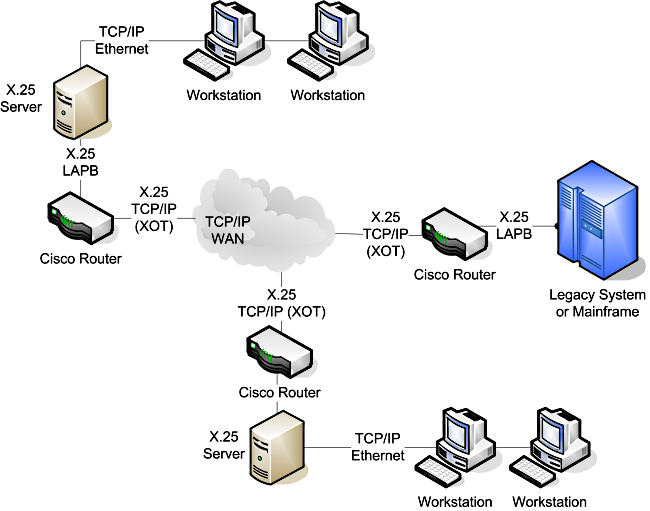 Each VC uses one TCP/IP connection. To ensure proper point-to-multipoint LCN mapping, client and host map TCP/IP sockets to their X.25 LCNs. PVC connections are badly implemented, using a Call Establishment emulation to establish the mapping of socket to LCN.